The day began with Member States adopting a resolution urging them to adopt and implement evidence-based environment and health policies, and to achieve the objectives of the European Environment and Health Process. The session opened with a short film in the Voices of the Region series, featuring midwifery student Ms Lauren Marie Grech speaking on the changing role of her future profession. 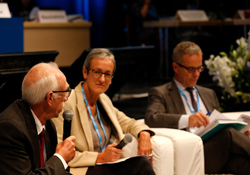 “The health workforce is the beating heart of any health system, and the cornerstone of universal health coverage,” said Dr Hans Kluge, Director of the Division of Health Systems and Public Health, as he presented Towards a sustainable health workforce in the WHO European Region: a framework for action. Building on a broad consultation process, the framework interprets the Global strategy on human resources for health: Workforce 2030 in a regional context. It has 4 strategic objectives: to transform education and performance; to align planning and investment; to build capacity; and to improve analysis and monitoring. Based on a proposal by the Standing Committee of the Regional Committee, WHO/Europe also developed a toolkit that provides structured access to proven strategies on human resources for health, planning tools, evidence and concrete case studies. Dr Kluge thanked the Department of Health (England, United Kingdom) for providing their support in developing the toolkit. A panel facilitated by Dr Daniel Reynders, Head of the International Relations Unit, Belgian Federal Public Service of Health, Food Chain Safety and Environment, considered how the regional framework complements actions at the global level, and how it will be implemented at the national level. Dr James Campbell, Director of the Health Workforce Department of WHO, underlined that the global focus on the health workforce has increased substantially in recent years. He noted that the technical, political and governance bases to ensure a sustainable workforce are in place, and called for strengthening implementation at the national level. Ms Christine Berling, Head of International and European Affairs, Directorate General for Health, Ministry of Solidarity and Health, France, described the recently launched policy to improve the health profession in France and the valuable work being done across the world. She noted that a key element is increasing access to health care in rural areas by encouraging health professionals to cluster together in centres, fostering the use of telemedicine, developing ongoing training and encouraging medical students to experience working in rural areas through scholarships. A delegate of the Republic of Moldova outlined the challenges of nurse and doctor shortages in the country, and of many nurses and doctors reaching pensionable age. She explained that a stronger focus on mobility within the country and better career prospects are improving the situation, and thanked WHO and the South-eastern Europe Health Network for their support. A delegate of Estonia, speaking on behalf of European Union (EU) Member States, underlined their commitment to act on the objectives of the framework. She highlighted the challenges of gender inequality and poor geographical distribution of health workers, and called on Member States to make the best use of the toolkit. A representative of Turkey referred to the challenges of providing enough health workers to meet the needs of migrant and refugee populations. He drew Member States’ attention to the adaptation training Turkey provides to health professionals from Syria now living in Turkey to address this. A delegate of Hungary noted that the country’s accession to the EU led to an outflow of health workers. She described how the country is countering this trend by focusing on training, extending the competencies of nurses, increasing remuneration and improving working conditions. These steps are showing positive results. Several Member States raised the issue of anticipating and planning the profile of the future health workforce, and questioned the current emphasis on specialization rather than primary health care. Many welcomed the intersectoral, multistakeholder approach proposed by the framework, and expressed widespread support for both the framework and the toolkit. WHO Director-General Dr Tedros Adhanom Ghebreyesus described the health workforce as a building block of health systems, and asserted that there can be no universal health coverage without a health workforce. The resolution to accelerate efforts towards achieving a sustainable health workforce, to engage the relevant sectors and to ensure effective implementation of the framework for action was adopted by consensus. A film featuring Mr Josef Probst, Director-General of the Main Association of Austrian Social Security Institutions, opened the session and provided a payer’s perspective on the topic. Access to medicines is essential to universal health coverage, noted Dr Hans Kluge in his opening presentation. “However, new high-priced medicines in the European Region pose a challenge for most countries, and for some, they remain unaffordable,” he added. A number of Member States echoed this message. During discussions, delegates highlighted the enormous challenges of providing quality medicines at a financially sustainable price; the lack of transparency in the real cost of medicine development and production; and the complexities of intellectual property rights and trade agreements. Austria emphasized that the issue is not so much technical as political, and noted that it is up to policy-makers to frame the market in which the pharmaceutical industry works. Norway reaffirmed that providing access to certain medicines is a challenge even for high-income countries, and the Netherlands expressed its objection to value-based pricing of medicines. Member States agreed on the importance of collaborating to share information and best practices on procurement, negotiations and health technology assessments in order to achieve access to medicines. They noted that political will and mutual trust are essential. Countries also acknowledged WHO’s role in providing technical support and fostering collaboration. In a statement, the World Heart Federation reiterated that all stakeholders, including the pharmaceutical industry, must work together to achieve fair pricing. Various civil society organizations acknowledged the discussion as a valuable one. The decision was approved and Member States commended WHO/Europe for its work on the issue. Finland, Germany, Israel and Romania were nominated to put forward their candidatures to the WHO Executive Board in 2018. Denmark, Hungary, Lithuania and Uzbekistan were elected to serve a 3-year term as members of the Standing Committee of the Regional Committee from September 2017. Czechia was elected to serve on the Policy and Coordination Committee of the Special Programme of Research, Development and Research Training in Human Reproduction, serving a 3-year term from 1 January 2018. The session opened with a film featuring Ms Ana Kasradze, International Health Regulations (IHR) National Focal Point for Georgia. She described her professional and personal experience with the IHR, and her work preparing for and responding to health emergencies in the 10 years since the IHR came into force. The IHR form the foundation of strong country capacity to address the full cycle of health emergencies. “The document presented today is the result of a 1-year consultation that was held to guide country action in line with the Sustainable Development Goals and Health 2020,” explained Dr Nedret Emiroglu, Director of the Division of Health Emergencies and Communicable Diseases. The document operationalizes the draft global implementation plan, applying it to the European context, and proposes the development of a regional action plan. It calls on countries to take an all-hazards and whole-of-society approach; prevent, prepare for and respond to all public health threats; and link emergency response to health system strengthening and core public health functions. It also defines 5 priority areas, including assessment, management and communication of risks, and monitoring and evaluation, with a special focus on laboratory capacity-building. Many Member States expressed their support for the document. They highlighted the importance of monitoring and evaluation, working in partnerships across sectors, and building capacity through trainings and simulation exercises. They stressed the role of networks and bilateral agreements on emergency preparedness and response as key resources. Dr Zsuzsanna Jakab, WHO Regional Director for Europe, outlined the steps being taken to strengthen governance at WHO/Europe. These include aligning global and regional governance; deciding when and how declarations adopted by regional conferences can be brought to the Regional Committee; establishing the procedure for web-based consultations on Regional Committee documents and resolutions; and strengthening WHO cooperation with countries. Several Member States highlighted the usefulness of the report on country performance in the Region. The delegate of Germany noted that Tuesday’s technical briefing on country work, where delegates met and discussed country office operations with WHO representatives, was extremely well received. Countries also expressed their broad support for online consultations, which strengthen transparency and inclusion, but expressed concern at the short response deadlines. The first 1000 days of a child’s life are a critical time of development, during which infants need a stable and stimulating environment to promote their health. This includes nutrition, opportunities for early learning and protection from threats. Dr Barbara Czeizel explained the steps that Hungary has taken to improve early childhood interventions for children with special needs. Key to this is an interdisciplinary approach, where everyone meets around the child and develops a “child path” that sets down steps and action to promote their individual development. The subsequent discussions touched on a range of issues, including the importance of sharing proven interventions such as kangaroo care and the need to demonstrate the economic case for investment in early child development. Participants suggested that WHO should develop a tool to assist countries in assessing the initiatives they have in place. At this briefing, Member States shared their experiences of addressing multidrug-resistant tuberculosis (MDR-TB) with a view to use these lessons to implement the regional and national action plans on AMR. The session opened with a statement from the European Centre for Disease Prevention and Control and the Food and Agriculture Organization, representing important international approaches in human health and agriculture sectors. This was followed by invited interventions from Belarus, Denmark, Germany, Greece, Kazakhstan, the Netherlands and the United Kingdom. Important lessons shared by delegates included the value of rapid diagnostics to start focused treatment as soon as possible; the importance of addressing AMR at the human–animal–environment interface (the One Health approach); the value of data/evidence-driven policy to set targets and enforce legislation; and the insight that even countries with a low incidence of MDR-TB or AMR cannot choose to be complacent. In Belgium, for example, health gains (in terms of reduced AMR prevalence) were lost again over a period of time. Investment for public health can help to achieve a peaceful, secure, inclusive, resilient and sustainable economy, society and planet. Conversely, a business-as-usual approach leads to high costs for individuals, families and communities. Investments for health and well-being are both drivers and enablers of sustainable development. Strong evidence shows that investing US$ 1 in public health programmes leads to returns of US$ 14. Yet the benefits of investing can also be expressed in social returns. Social returns on investment account for social value from the stakeholders’ perspective, taking into consideration all dimensions of an investment’s impact. This session presented 3 evidence-based publications on investment for health and well-being and on social returns on investment. They feature quantitative arguments that build the case for investing in health. The session also shared useful tips for policy-makers. As countries grapple with addressing global processes such as climate change, pandemics and unsustainable consumption patterns, health diplomacy now has renewed relevance, making it central to health governance and integral to foreign policy in many countries. This session saw the launch of “Health diplomacy: European perspectives”, which contains 17 case studies from the Region focused on topics such as negotiating for health in the Paris Agreement on climate change; pursuing the Sustainable Development Goals; placing AMR on the global agenda; and showing the relevance of city health diplomacy. The publication also includes chapters on subregional health diplomacy efforts. Following an introduction by the book’s editors, delegates shared their experiences.